For a short time, I was the best Sonic the Hedgehog 2 player in the world. Let me roll that back a bit. My parents separated when I was three years old. For several years, I had the classic two-family holidays, either splitting the holidays up or spending time with both sides for the big ones. The summer before first grade, however, my mom and step-dad moved us from Tulsa to Dallas so they could go to school. The parenting situation evolved to our spending most of the summer and winter break with our dad. When we moved back to Tulsa a couple of years later, our situation “evolved” even further. My father has issues, which got out of hand, and it reached the point where we stopped having what one would call a traditional holiday-sharing arrangement. By Christmas of 1992, it was mostly just awkward. That was the Christmas that Sonic the Hedgehog 2 ruined the surprise. My brother and I wanted a Sega Genesis. (This would be as opposed to the Super NES, as mentioned last time.) My mom had played it coy, accurately representing our financial situation as one where maybe we wouldn’t be able to afford such an expenditure. My hopes were high in the way of ten-year-olds, but I’ve always been pretty good at tempering my expectations, and I would not have been terribly disappointed if what she’d implied were true. Unfortunately for us all, she took us to see our dad a few days before the holiday, and my brother and I unwrapped the single, small, shared gift to find Sonic 2. I said I wanted to open it now to read the instruction booklet (wow, I am getting old), and was only mildly cautioned not to do so, just in case. I could tell by the tenor of the warning that my hopes would come true, and I read the nonsense backstory and how to use a controller that my hands had never curled around. I’m almost positive that my brother didn’t fall for the ruse. Anyway, we got our Genesis and Sonic 2 and off we went. Video games are unusual in among artistic media for many reasons, but one of the most obvious is that the second game in a series is frequently, if not usually, better than the first. This is especially obvious compared to cinema, where the sequels tend to be lesser than the originals in a series (with some notable exceptions). I wondered about this, briefly, before the answer bludgeoned me about the head and body with no regard to my personal safety. Cinema is often about the idea, and when mining the same territory, it can be difficult to replicate the rush of that originality. With a game, though, it is not about the idea as much as it is about the execution. The language and tools of film are largely set and accepted; the language and tools of games are larger, younger, and constantly evolving. Sonic the Hedgehog is a really good game. Sonic 2 is a great one. Almost exactly the same idea as the first game, with new gameplay, better level design, better graphics, better performance… nearly every game sequel that surpasses the original fits into this slot one way or another. We played Sonic 2 to completion, learning its secrets back in the days when you only had word-of-mouth and the monthly game magazines for help you out. We got all the Chaos Emeralds, allowing us to unlock Super Sonic, who it occurs to me now might owe a debt to Dragon Ball Z, what with the turning yellow and getting even more spiky. We got our time out of it and set it aside for other game-type pursuits. Almost a decade later, I moved out of my mom and step-dad’s house. I lived with them for the first year of college, but the opportunity came to live with my best friend and our combined gaming collection, spanning consoles from the 8-bit to, uh, whatever-the-PlayStation 2-was-bit eras and hundreds of games to play on them. Shortly before the tenth anniversary of the first time I popped it into my Genesis, I started playing Sonic 2 again. I could not begin to tell you why that was. At the time, I had a full-time job delivering pizza and was also carrying a full course load at a pretty good university. My free time was limited, at best. Even still, when I found that Sonic 2 was still a lot of fun, I started playing it all the time, practically to the exclusion of every other game. Home from work, everyone else is asleep, 9am class, let me get in a game of Sonic 2. In retrospect, that was kind of weird. To many gamers, the prospect of achievement is second only to fun as far as reasons to play. For me, one could argue that achievement is the primary reason. (Probably accurately.) I have always been the type to strive for 100% completion in a game. I collect every heart piece in Zelda; I highlight every square of the map in Metroid; I even restarted Final Fantasy IX when I discovered that I had missed my one and only chance to get the weapon that would teach one of my characters a skill. There are dozens more examples of this probably pathological behavior scattered about my gaming history. I want to get everything a game has to offer, and being the best in the world at any game, even for a brief window, is a pretty proud accomplishment. So back to my thesis: for a short time, I was the best Sonic the Hedgehog 2 player in the world. I say this without any sort of official designation, and in fact with the knowledge that it is almost definitely not 100% true. Probably there is someone in Japan who can beat the whole game purely from muscle memory, right now, without having touched a Genesis controller in five years. I’m definitely not as good as that person. So: it’s probably more accurate to say that I was the best in the world at Emerald Hill Zone. There were seven Chaos Emeralds to collect, which you got by beating a pseudo-3D minigame. (How well does a 16-bit machine render 3D? Ah… poorly.) 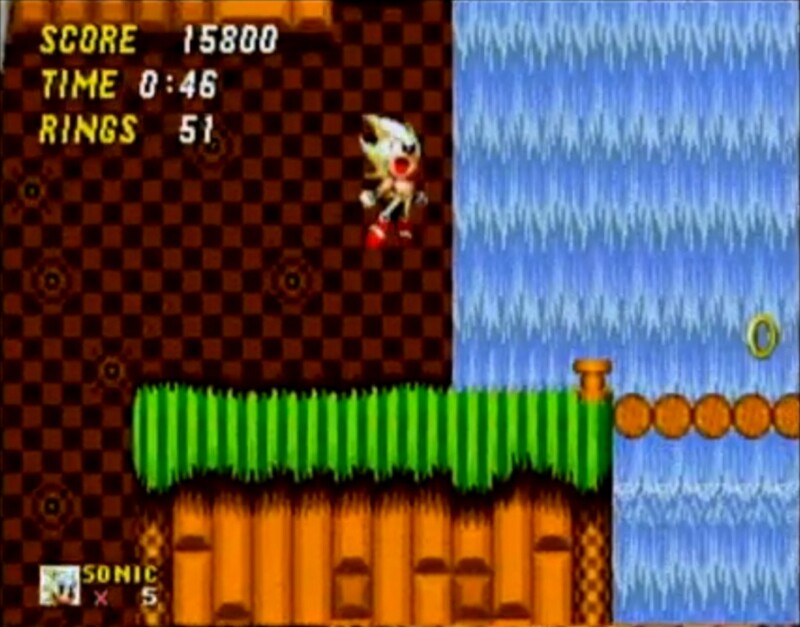 There were seven checkpoints in Emerald Hill Zone through which one could collect said Emeralds. If one knew the location of all rings in the Zone (which I did) and the location of the checkpoints (which I did), one could collect all seven Emeralds in the first world (which I did). I knew Emerald Hill Zone backwards and forward, and I’d leave it with 30-odd lives and the ability to waltz, mostly invincibly, through the rest of the game. We passed the point a long time ago where any reasonable person would consider playing games to be more of a waste of time than movies, TV, or books. At this point, I imagine that a lot people under 25 read more text on their game screens than they do from printed paper. (That’s kind of horrifying, and I hope it’s not true, but better games than… some books.) Why would replaying an old game be more of a waste of time than rereading a book or watching a beloved movie again? Revisiting the classics is not a waste of time. Every medium has items in its library that are worthy of repeat exposure, to understand in a new context or to use in judging what has come since or even, oddly, just because they are enjoyable. There is no reason that this would not apply to games. I know that this will shock you, coming from us, but re-experiencing greatness is never a waste of time. This entry was posted in 16-bit, game, Genesis and tagged book, college, Dragon Ball Z, Final Fantasy, Genesis, holidays, Metroid, movies, PlayStation 2, Sega, Sonic the Hedgehog, Super NES, TV, Zelda by Jesse. Bookmark the permalink.